We artists are often asked to do something along the lines of somebody else’s ideas. If the subject matter turns your crank, I recommend that you should say “yes.” You should never say “when.” Commissions tend to bend your mind into dimensions where you may not at first be prepared to go. This is good for you. If the job or the patron starts to make you angry, you should pretend the job is for someone else. Even for some higher power. Popes are only popes but art is pretty darned permanent. And another thing, it doesn’t matter who you’re dealing with, get a decent deposit. This letter was originally published as “Commissioned artwork” on November 12, 2002. Simple truth based on experience. I learned to never take commissions……..they turn into another person’s vision. that is the biggest pleasure in this short life. Also a good point on commissions being sometimes uncomfortable – that is where growth comes from… moving in directions that might be uncomfortable, perhaps even scary. If your dreams don’t scare you, they aren’t BIG enough. Painting a ceiling would indeed lead to a (k)new perspective. Thank you for sharing this beautiful story of Michaels life, self discovery and his vision in art to our world. Sadly I have not been fortunate enough to see the Beautiful work in person, yet it is on my bucket list. Let me just add, I ask for 1/2 up front, and the remaining balance due before I deliver my work. I do many Commissions proudly but inject my own vision to their request to make it “my work”. Paint on dear friends! I have done a number of commissions and have been challenged into directions I never would have gone on my own. It has honed my skills and enlarged my personal themes. I suppose coming from the advertising art field, doing artwork for others isn’t that unusual. While it generally starts with the other person’s idea, the artwork is certainly my own in style and approach. But if it doesn’t feel right, I refuse the job and may recommend another appropriate artist. MIKE???? Made me rethink your entire site and advice. Agreed, Sally! “Mike” is a bit “below” the top! Loosen up, guys. 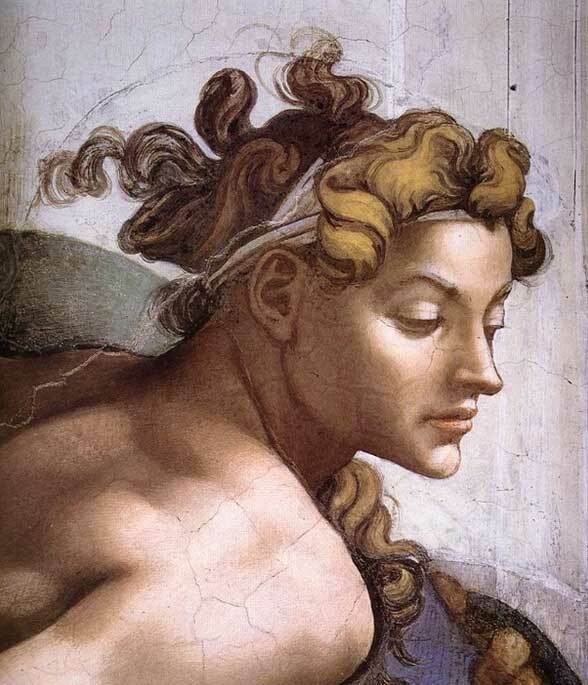 Don’t disparage this site just because you believe the artist is due more reverence than the word “Mike” suggests. He was just an artist in those days, trying to make a living like we all do. I worked as a graphic designer in the newspaper business for 20 years or so. In effect, I did commission work every day, and although I was paid (poorly, but paid) for my work, I often felt like I was selling a piece of my soul when. I was stretched to my limits many times, trying to capture and express someone else’s vision, always on a tight deadline; when I “channelled” the client, it was a little disturbing (as a detective thinking like the killer he’s chasing). When I not only got it right but also exceeded the client’s, it was magic. There is no room for ego in that work; it gets dropped to the floor when the client is calling the shots. I found, however, that it was good training for the other creative work in my life, in that I can usually look at it objectively with both a critical and compassionate eye, as if I were the buyer. I’m kinder to myself. Just as well he stayed with the tough discipline of fresco, and didn’t make the same mistake that Leonardo Da Vinci made with the Last Supper! I had trouble figuring out who Mike was! His real name evokes such awe. About getting some money up front, my experience is that if the client has nothing invested he/she may lose interest and you have finished work on your hands. Andrea: I’m sure you see the lesson there. The work is yours until you are paid. Never let a work leave your studio until you’ve been paid. You can repossess it, you know-just like car dealers and mortgage companies do. 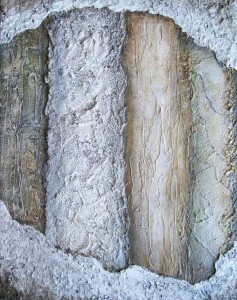 Myself, I would tell the patron I wanted the painting back because I was thinking about entering it in a show. Maybe follow that with the suggestion that if the painting won an award, it would be worth more. I have done many portrait commissions. I love doing oil portraits and always get a deposit before starting the commission. I suppose I really enjoy the challenge. I have met many wonderful people by doing portrait commissions. Ah – commissions! I get soooo anxious whenever asked. For commissions I start at £500 (much more if the collector wants something much larger, more complicated than or different from my usual work.) To allay the fear of not being paid (it happened to me once when the finished painting didn’t please the commissioner and was deeply hurtful as you can imagine) I now ask for the full price to be paid in advance and make it clear in the acceptance agreement that it is not refundable unless I am taken ill or for another reason cannot complete the painting or if the painting were damaged in transit but to avoid this I use a good courier or deliver whenever possible in person. I don’t lift a pencil or brush until the full payment is in my account. Buyers who really want the painting understand completely. Those who are just playing with the idea of a commissioned painting you never hear from again. This way you can, once paid, throw yourself joyfully into the painting. Yes it’s a leap of faith – but for the buyer and the artist. It should never ever leave you in the lurch, unpaid and with a painting you wouldn’t have chosen to paint which may well be too personal-to-the-commissioner to sell elsewhere. This is partly why I love selling small paintings on eBay for very little prices – I know you probably all think I’m mad (and many artists think I’m letting the side down) or that I don’t, as a competitive artist said to me the other day, that I don’t value my work. I do. But I love the freedom of selling hundreds of paintings every year (it all adds up) and the fact that in the rare occurrence of someone not liking their new painting or it arriving damaged (it does occasionally happen with the everyday courier or post) I can refund instantly by PayPal to soothe the customer’s ruffled feathers. Most of them go on to buy more paintings, becoming good collectors. I’m not as silly as I seem!!! 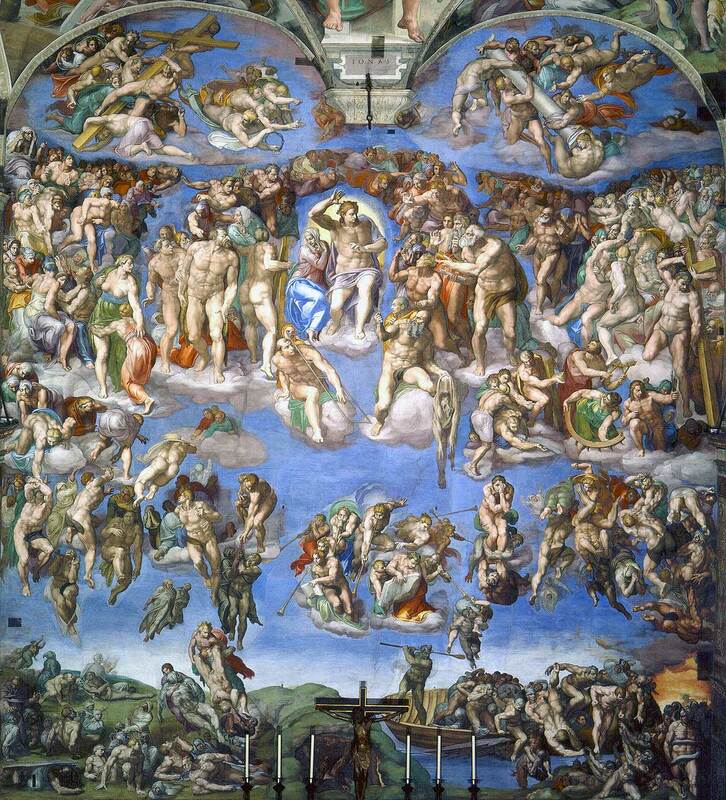 Has anyone else ever noticed that The Last Judgement looks at a distance like a death’s head? Note the two eyes and then below the teeth. I saw it in person before it was cleaned. I climbed up into a little room at the far end of the chapel where one can see the whole of the chapel at once, peeking through a lattice. That was when I saw the head. What a surprise! 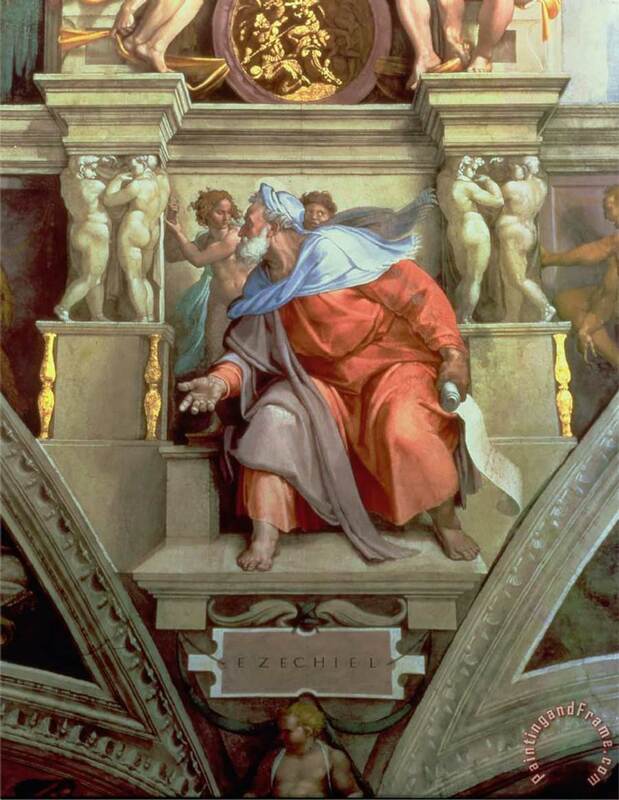 I had seen pictures of that painting for all my life and never noticed that. Maybe it was his revenge on the Popes. The ‘speculative’ system we have today, which the artist follows their vision independent of commission (and relies on a middle man to sell), began in 17th Century Holland. It was a radical departure from commission based production. The role of the artist in society was changing from guild based craftsman to that of an intellectual. The Paragone arguments of Cinquecento Italy, which sought to elevate painting and sculpture to the status of Liberal Art, the creation of the Art Academy, the decline of the Spanish empire and the Catholic Church, and the rise of the international corporation that subsequently enriched the middle class, all these factors empowered the individual artist and radically changed what was being consumed, and what was celebrated as Fine Art. 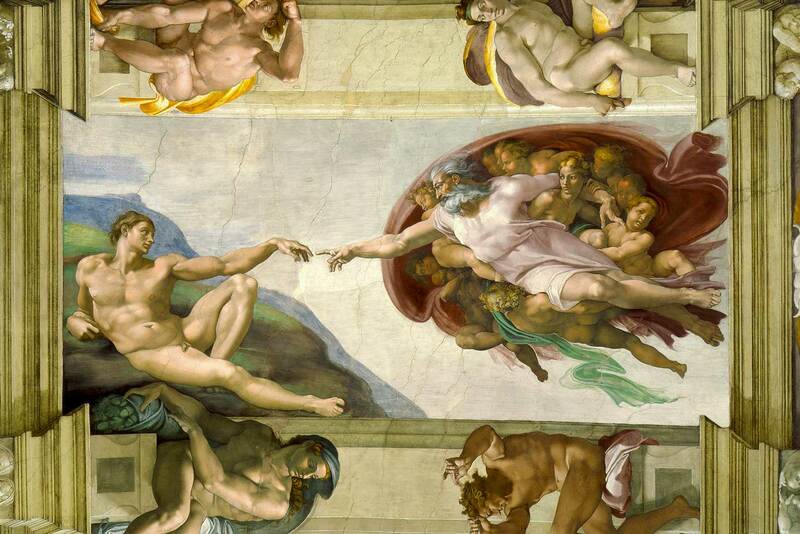 I had the good fortune to see the completely restored version of the Sistine Chapel in person in my early 70’s ( my age then) after waiting almost 70 years for a real view. It was a memorable experience & it was worth the wait. The colors as well of the concepts and drawing a work of genius for all time. All my oil paintings are commission paintings, 50% down, and the other half plus taxes when delivered! Do Your Art! 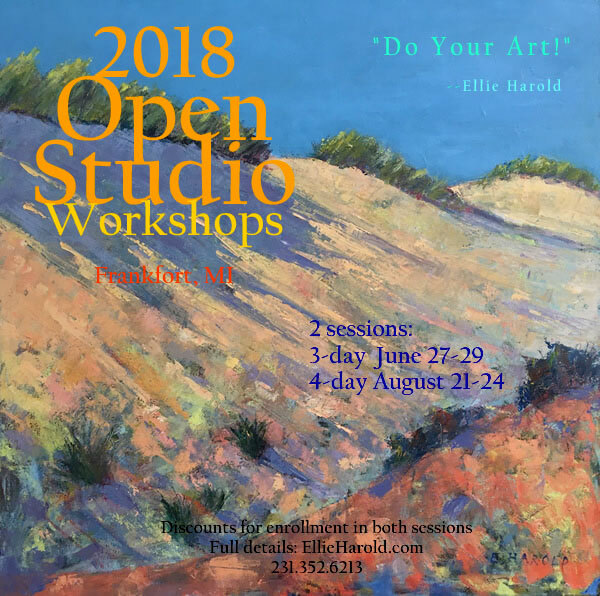 Join Ellie Harold (7 Habits of Deeply Fulfilled Artists) for an art immersion experience 4 blocks from Lake Michigan, near beautiful Sleeping Bear Dunes National Lakeshore. Two sessions offered: 3-day June 27-29 ($375) and 4-Day August 28 – 31 ($450). Energize Your Art Life. 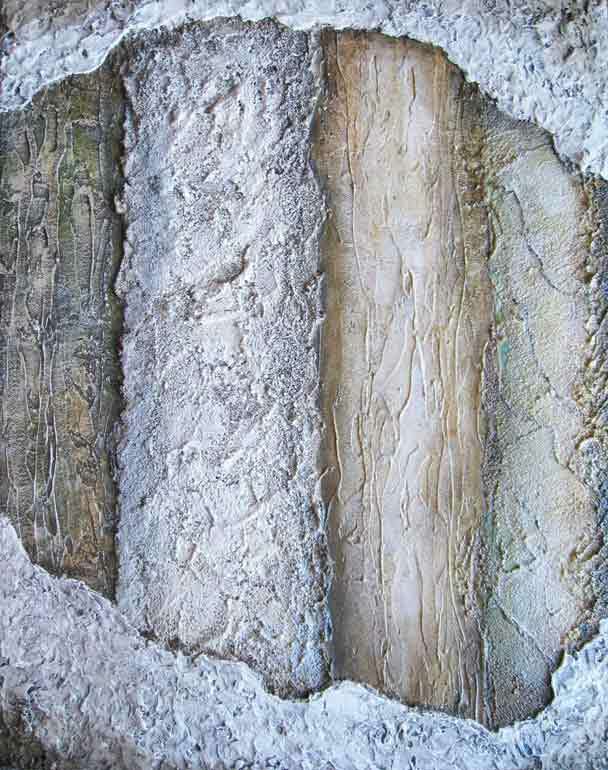 The Open Studio format promotes the unfolding of your creative process. Each day you’ll enjoy content and demos related to authentic mark-making, painting as process, and intuitive color along with guided prompts and mentoring topics. New painters as well as more experienced artists desiring a deeper involvement with their art will find the Open Studio Workshops invaluable. All levels and media welcome. Some oil painting experience is desirable, although complete beginners have also benefited from the workshops. If you’d like to try oil painting for the first time or want to refresh, basic color mixing will be reviewed on the first day of each session. Optional materials/equipment provision available Off-site lodging within walking distance. For more information and testimonials, visit Ellie’s website.